Premium quality Compart Duroc™ pork is the result of a carefully managed pork breeding program, managed and perfected by a family farm. 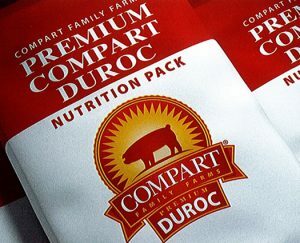 Compart Duroc™ hogs are bred, born and raised on small farms where our family members are involved in the day-to-day management of their stock. The breeding program is the result of 55+ years of combining the very best purebred lines of the Duroc breed. Compart Family Farms™ have also conducted extensive research and development to create a proprietary Compart Duroc™ feeding program. This feeding program optimizes both the pig’s performance and its meat quality. This, coupled with raising the pigs in comfortable, environmentally stable facilities, reduces stresses that adversely affect muscle quality. All natural, mouthwatering, rich flavored pork, with superior tenderness and natural juiciness, that’s the “Compart Duroc”™ promise to you. It’s a difference you can see and taste! Our pork is bright reddish pink in color and contains a higher percentage of marbling (intramuscular fat) and a higher pH. 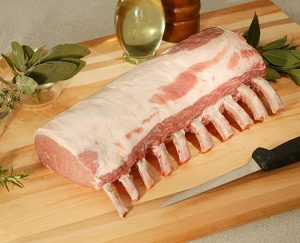 We provide fresh pork in its natural flavor and juice, without injecting or pumping. This a tender, juicy and flavorful dining experience. The most desirable color to look for when purchasing pork is dark pink to dark reddish pink. Although pork is known as “the other white meat,” because all pork turns white after being cooked, it is the darker, reddish raw pork that will give you a juicy, tender final product to serve. Genetic selection for Marbling is an extremely low heritable trait. The Compart Family have been extremely progressive in Genetic selection. 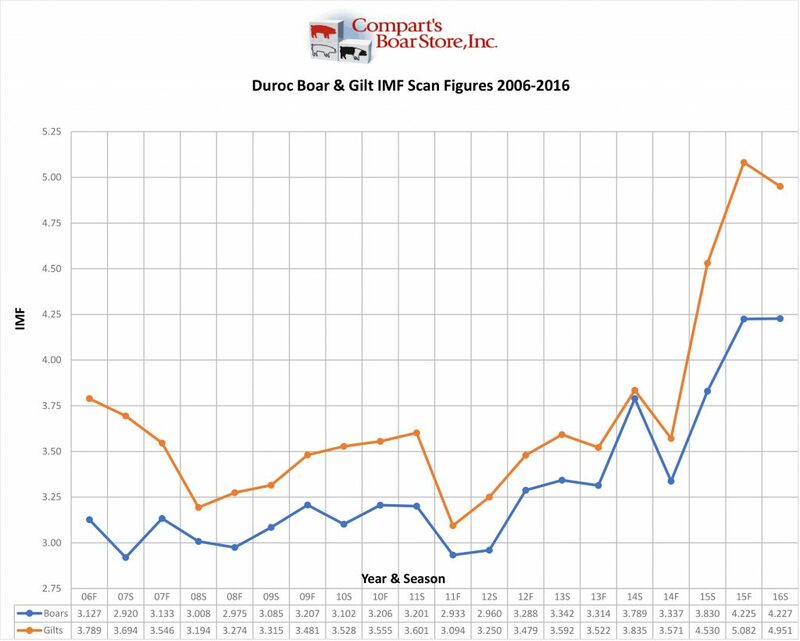 Real Time Ultra Sound Scanning and testing have move the Compart Duroc Line 10 years ahead of any Duroc line on the market, as you can see by this graph. If it is Not “Compart Duroc” pork it is 10 years behind for Marbling and Meat quality. Durocs are red pigs with drooping ears. They are the second most recorded breed of swine in the US today and a major breed in many other countries. They can range from a very light golden, almost yellow color, to a very dark red color that approaches mahogany. The history of the Duroc breed dates back to Columbus bring red hogs to America on his second voyage. DeSoto also brought red hogs to this country, presumed to have come from Spain and Portugal. 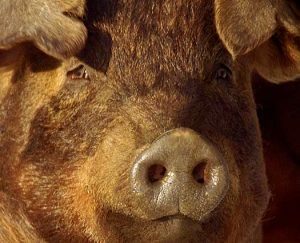 In 1823, a red boar from a litter of ten whose parents were believed to be imported from England, was obtained by Isaac Frink of Saratoga County, New York, from Harry Kelsey. Kelsey owned a famous trotting stallion, Duroc, and Frink named his red boar in honor of the horse. This boar was known for his smoothness and carcass quality. At the 1893 Chicago World’s Fair, Durocs gained wide popularity at the first successful Duroc Hog Show. This was only the beginning of the Duroc popularity and success, which continues today. The first organization for the purpose of recording, improving, and promoting red hogs was the American Duroc-Jersey Association, which was established in 1883. In 1934, that organization became known as the United Duroc Swine Registry, for the sole purpose of recording and promoting the Duroc breed. Durocs have become a sire of choice to the American farmer. 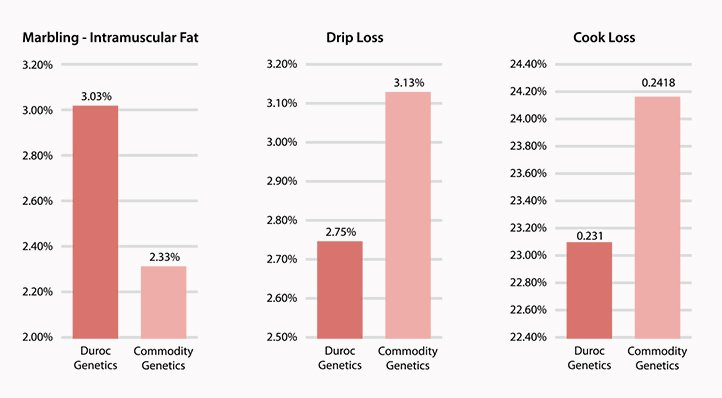 The climb of the breed has been accelerated by many distinguished accomplishments in longevity, lean gain efficiency, carcass yield and product quality as a terminal sire. Durocs are identified as a superior genetic source for improving eating qualities of pork in the recent National Pork Producers Council Terminal Sire Line Evaluation. Their advantage in muscle quality combined with their well-established ability to grow fast has positioned the Duroc breed as an outstanding terminal sire choice. 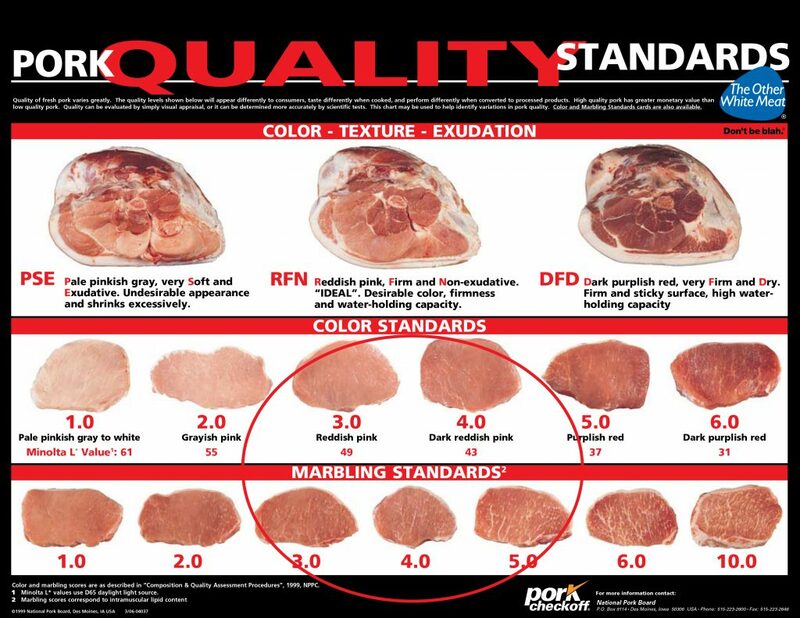 Although Duroc has been Identified as a superior breed, Compart Duroc lines have up to twice the Marbling as any other Duroc line in the industry, due to the Compart’s intense testing and selecting program for the past 70 years! Compart Family Farms™ has a strong commitment to testing and performance documentation. The Compart family has invested into research facilities where over 100,000 pigs were tested the past 15 years. These research tests were designed to figure out the very best feed natural ingredients to feed the animals to maximize the genetic potential they have been bred for. All pigs utilized in the Compart Family Farms Compart Duroc sired meat program are of the same genetic makeup, and fed the same proprietary ration throughout growing and finishing phases. This combination reduces the variability routinely found in the pork industry today. This information is essential in the formulation of the feeds that are utilized by all farms involved with the Compart Family Farms™ Compart Duroc sired program. What this means to the consumer is, the very most uniform product with more consistent premium quality eating characteristics that are all natural.